Please see my latest posting on the e-zine A Hopeful Sign about being in Southeast Asia and experiencing the 5-star hotels juxtaposed with the extreme poverty of the region, as well as its affects on our kids. To be fair, it’s also about bringing the lessons of the world in which they do not live to them and making it accessible via experiences right here in Tokyo as well as the tie-in to the Jewish holiday of Passover, that happened while we were visiting Cambodia. The E-zine is called A Hopeful Sign for a reason – the messages of hope and positivity it brings are a breath of fresh air in today’s increasingly negative and pessimistic world. Go see my posting, but also go to see all of the other wonderful writers who post there. Click HERE. I never doubt that my kids are indeed children of privilege, which is not necessarily bad, because the important thing, I believe, is what one does with that privilege. In recent weeks my kids have had many lessons in humility and giving, and the grace that comes along with the ability to recognize the gifts of humanity, no matter how they are packaged. We started our journey of lessons at the Asian University for Women (AUW) fundraiser. AUW, located in Bangladesh, takes young women from around the region and gives them a top-notch university education. The support committee, of which I am a part, showed an American PBS film about Women and the Taliban in Afghanistan and how they are fighting back. My son who is 13 understood a lot of it, but my daughter who is 10, did not. The important part for both of them, though, was the speeches that followed the movie by the two girls who had come to Tokyo from AUW in Bangladesh. One girl, originally from Afghanistan, stressed the importance of education, finding one’s voice, and telling one’s story. The other, from Nepal, spoke eloquently on the idea of one person making a difference and changing the world. Both kids were enthralled by these two girls. Obviously young, they carried themselves with poise that belied their backgrounds and they spoke confidently about their viewpoints and ideas, something my children could admire and appreciate. It wasn’t our first trip to the region, but seeing the extreme poverty never gets any easier, especially for the kids. Hanoi was chock full of honking cars, a mix of traditional and modern architecture, and people who were thrilled to see tourists. Many people approached us on the street to sell us something, and of course, some were kinder than others. When my daughter expressed discomfort, my husband explained that this was how people made their living; not everyone can afford a storefront. We bought things we wanted and said no to vendors when we had to. 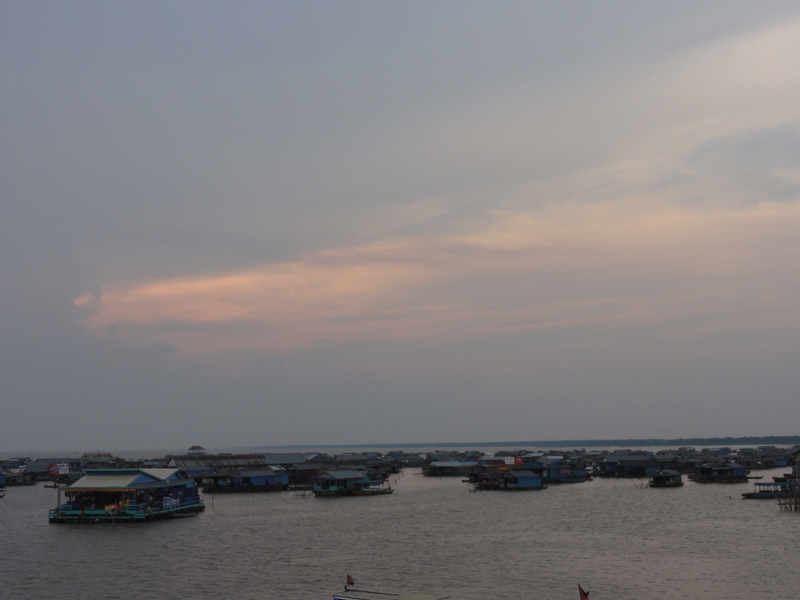 In Siem Reap, the resort hotels eclipse some of the more extreme poverty, but it was really unavoidable as we took a boat ride up the Tonle Sap Lake to see the floating villages there. Random kids approached us over and over again, begging, one little girl with a snake around her neck asking if we wanted to give her a dollar to see the snake up close. Another girl approached us as we were eating our dinner at a sidewalk café. My daughter was stricken when we wouldn’t buy her books and the girl groaned her disappointment. I faltered when I explained that one to my own darling girl. That young lady was helping her family by trying to sell the books. Maybe she had been in school all day and worked a little to make extra money at the dinner hour, but this was her life and this was what she knew. Even I could tell that the explanation fell flat – of course the girl could observe that we could afford dinner in a restaurant and she couldn’t – but we noticed our daughter chewing on what she had seen and the ideas I presented. That night was the start of the Jewish holiday of Passover, and our normal celebrations at home include a large seder with many friends. It’s the holiday when we retell the story of the exodus of the Jews from Egypt – it’s a celebration of freedom. I had packed a few copies of our Haggadah, the book we read at the table for Passover, so the four of us sat in our hotel room after dinner reading about our ancestors and telling the story as it is commanded, as if we ourselves were enslaved in Egypt, feeling the yoke of slavery and the gratitude for the miracles wrought by God to bring about its end, even if did mean forty years of wandering in the desert. We tell it that way to encourage empathy and enhance that gratitude. In addition to telling the story faithfully to our children every year, we – Jews – infuse the seder with the Jewish value of Tikkun Olam, saving the world. “Let all who are hungry come eat,” says the Haggadah, commanding not just Jews, but really everyone, to share the gifts they are given. Even though it was the lowest-key seder we’ve ever had, and the smallest, it was by far the most meaningful. The kids were both able to talk about not just freedom to walk around and go wherever they please, but also freedom from tyranny and freedom from want. The Haggadah gave them language to appreciate the accident of their birth into a loving and financially stable, Western family. We were able to talk about the gifts of their good brains and the ability to use them and the bright girls who go to AUW on scholarship who have a stroke of luck to get their fine education whereas our kids tend to take their schooling for granted. They vowed never to complain about it. We saw some exquisite sights throughout Vietnam and Cambodia, things that will stay with us for the rest of our lives. One morning we woke the kids before the sun to see Angkor Wat at sunrise, an enthralling picture that I can still see weeks later when I close my eyes. To think that was built in the 12th century! Later that day, my son said that he was sorry he fussed (which he really hadn’t) about getting up because it was worth it, and he was going to tell his kids about it someday. “Maybe you’ll take your own kids to see it,” I suggested. I don’t think she understood my silent hug or the tears that sprang to my eyes as I surveyed both of my children. My children are among the luckiest there are to be American and live an exciting life abroad in Japan. They have every gadget available as well as access to the finest schools and activities in the world. I have no idea whether these lessons will stay with them even into next month, but I am sure that we planted seeds in the children that week, seeds that will hopefully bloom into beautiful tomorrows. 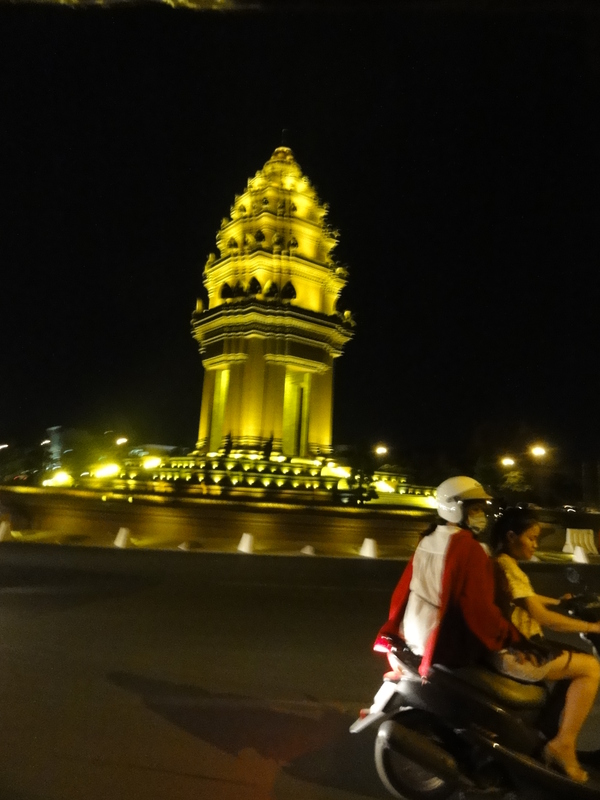 The last stop on our way too short, Southeast Asian extravaganza was Phnom Penh. But before enjoying the city, first we had to get there. It’s about 300 km from Siem Reap to Phnom Penh, and so many people take the short, 30-minute flight. But since we hadn’t seen anything of the countryside, and I didn’t want to deal with another airport (and I was being cheap), we decided to hire a car and driver to take us south along Highway 6, a road that has only been open for 5 or so years. This was not a decision lightly taken. We read a lot about the car and driver system in a few guidebooks and on TripAdvisor. The hotel in Siem Reap wouldn’t allow us to hire a small car, preferring that we rent a very large van at a very large expense, and recommended that we go into town to a travel agency and arrange the rental ourselves. We were a little nervous, but the agency was right on a main market street in downtown Siem Reap, and they were enthralled with our white faces. They were so eager to please! Within ten minutes they had arranged for the car to pick us up at our hotel at 8:30 in the morning and drive the 5 or so hours to Phnom Penh. They kept assuring us it would be fine, and the driver spoke English, so no worries. As promised the driver was right on time, but he spoke not a lick of English. That didn’t bother us really, and we managed to get all of our stuff in the small trunk. The kids and I squeezed into the back seat, and Marc sat next to the driver and we were off. Within ten minutes we had to stop on the side of the road. The driver stuttered “wait a minute,” jumped out of the car, and gave some money to a guy standing by. We have no idea what transpired between them, but we do know that we were traveling at high speeds for the next 4 hours and passing car after car, with zero police consequence. You do the math. It should have taken 5 or more hours to make that trip and we did it in four and a half including a stop for gasoline. It’s a small road – one lane each direction. But lanes are just suggestions in most of Southeast Asia, and we passed many buses and trucks – and cars. Not a single vehicle passed us. This guy aimed for speed, and speedy he was. I didn’t look, and Marc, from the front seat, said it was impressive. I did look out the side window, however, and saw shack after shack, followed by a market, followed by huge tracts of empty land. Since it is dry season in Cambodia, everything had a thin layer of fine dirt over it. I’m not sure how to express the enormity of the poverty. Phnom Penh is a city of over two million people, and has had huge growth in the past two years with population increasing more than 25%. It is fast becoming an international city after the big set-backs of the 70’s and 80’s. In Phnom Penh, we stayed at the amazingly fabulous La Maison D’Ambre, a small, boutique hotel near Wat Phnom, not far from the center of the city. Instead of room numbers, each suite has a name and it beautifully designed and appointed. We only had a day and a half in the city, the capital of Cambodia. 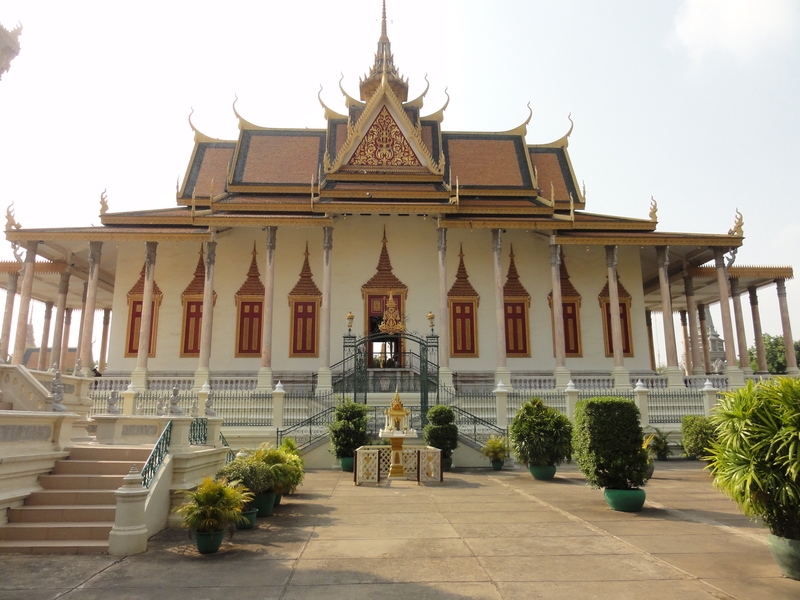 We went to the Palace, which also houses the exquisite silver pagoda. We were allowed to take photos only on the outside. 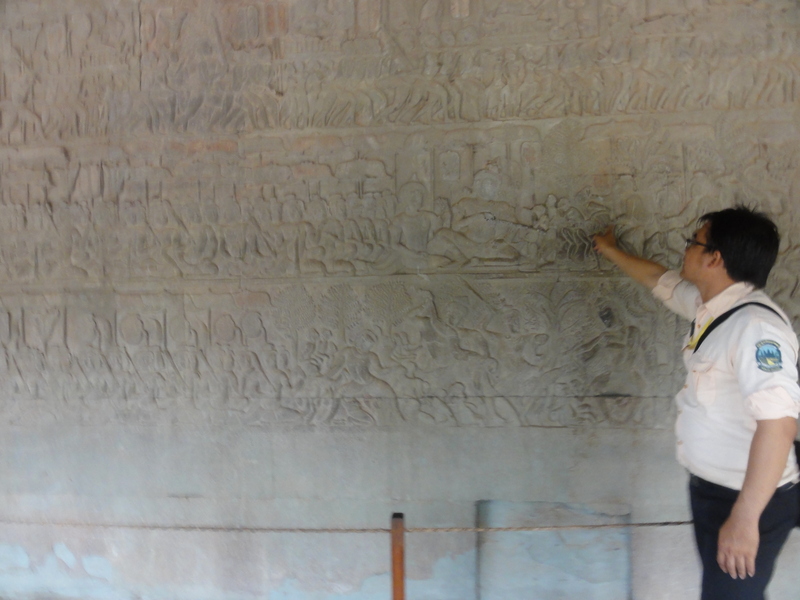 We saw the National Museum and all of its Khmer treasures. We had to stop and shop at the Russian market, where we drove hard bargains, but had to walk away from a few things when vendors wouldn’t meet our price. We also had to walk away from the food section of the market – we just couldn’t stomach the smell. Cambodian food has some pretty strong smells that overwhelm all of the senses. I’m loathe to qualify them as good or bad – just strong, overpowering the entire area. We also shopped in a more couture manner at Ambre, home of the best dress designer in the world, Romyda Keth. I have several of her dresses, and it was an honor to meet her in person. She even made the dress I wore for my son’s bar mitzvah. Of course we ate more Khmer food – Luk Lok, A Mok, and other enchanting tastes for lunch and dinner both days we were there. We couldn’t get enough of it. We even ate a little bit in the airport! Leaving from the airport in Phnom Phen on late Wednesday afternoon was quite sad. We had a wonderful few days of vacation. There’s not much that could have prepared us for the beauty and grand scale juxtaposed with the abject poverty of what we experienced in Siem Reap, but it is definitely something we will never forget now that we’ve seen it. Siem Reap is the name of the town closest to the ruins of Angkor, which date back to the 12th century. Sometime in the 15th century, the Thais overran the city and the Angkor society was abandoned, along with their towering and ornate buildings and temples. It wasn’t until the French sent expeditions into the Cambodian jungles in 1901 that the Angkor ruins were rediscovered. Siem Reap was making itself into a tourist destination in the early part of the twentieth century when Pol Pot and the communist regime came to power in the late sixties and evacuated the city, forcing residents into the countryside. It wasn’t until Pol Pot’s death in 1998 that Siem Reap was again discovered by international tourists and started re-making itself once again. Since 2005 it has become a major hub of tourism in Asia, hosting many beautiful hotels and other buildings. 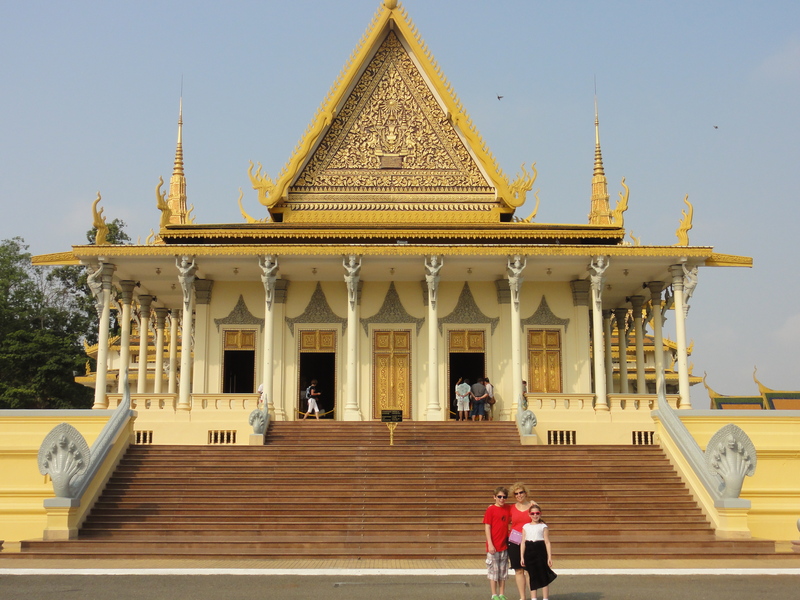 So far, despite international influences, the city remains true to its Cambodian heritage. Our hotel arranged for us to have a car and driver for our two days in the city, and they were truly wonderful, taking excellent care of us. 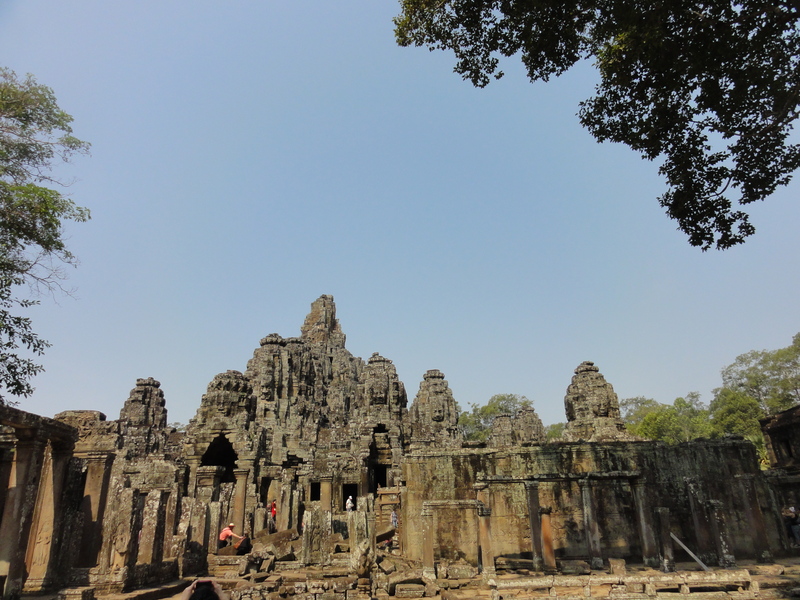 Our first stop was, what Marc felt, the most impressive, Angkor Thom. The soaring towers and detailed architecture made us feel quite small in comparison. The faces and etchings were carved intricately into the stone and we could see what had once been a palace for a great king. We saw battle scenes telling stories on the walls, all carved in great detail along with perfectly balanced doors, windows and balustrades. tourist draw in the city since the movie came out. 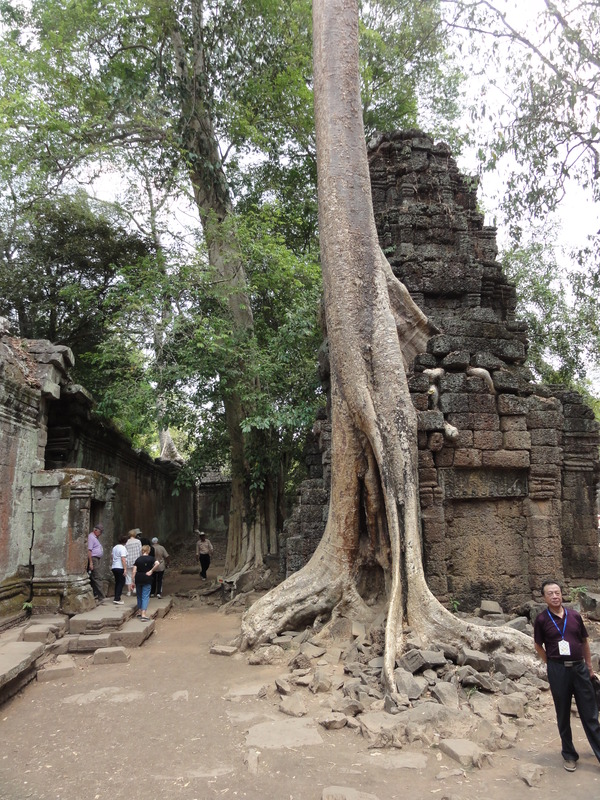 The trees in the Bayon Temple were particularly impressive, built directly into the architecture. It’s unclear whether that has happened over time or was intentional, but now the trees cannot be removed for fear of disrupting the foundation of the temple. 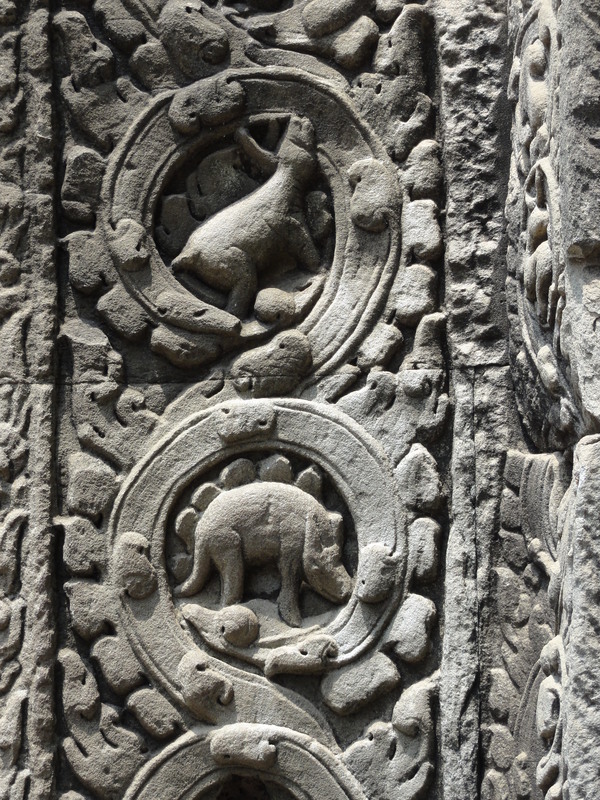 Particularly impressive and intriguing to me were the dinosaur carvings at Bayon Temple. I’m still in awe: how did people know about dinosaurs earlier than the 1500’s? Amazing. 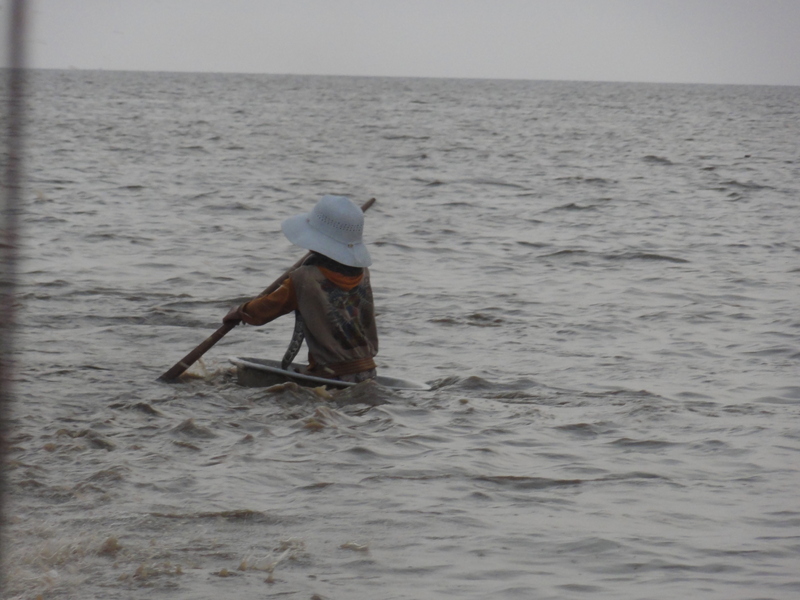 Later in the day, our guide took us to the Tanle Sap Lake to see the floating villages. These people live on the river year round, having their own shops, schools and life. 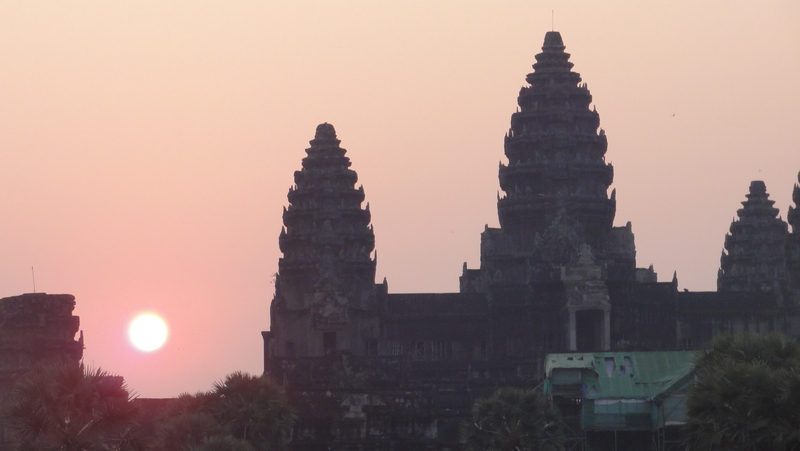 The second morning in Siem Reap, my dream came true: we went to see Angkor Wat at sunrise. A week later I can still close my eyes and see the red ball of fire stretching and reaching for the five towers, to climb above it as time marches through the day. We did climb all the way to the top of the temple, but the real majesty lay in that glorious sunrise. The town of Siem Reap itself is also coming into its own with the tourist trade. There are a few markets, including a night market. The streets are littered with cafes. What struck me as funniest, however, are the sidewalks chock full of easy chairs. That’s right – there may as well be a stack of barca-loungers right on the sidewalk. All of them are placed in front of massage place – you can get a 15-60 minute massage right on the street. Fifteen minutes cost only $1, while an hour was $20. Hard-pumping, Asian massage for $1 – wow. I didn’t do it on the street, but I had an incredible massage at our resort. Wow! course we drank mango, pineapple and passion fruit juice everywhere! We stayed at the Borei Angkor Resort and Spa, which I cannot recommend enough. Not only is it beautiful, with stunning landscaping, generous rooms, and delightful amenities, but we were treated like kings by every single member of the staff. This little girl didn’t have a boat; she was on the river in a pot. kids barely dressed who asked us for money. We had many incidences of just shaking our heads at the opulence of a hotel placed next to a cluster of shanties. Things happen in fits and starts, we understand. But it was hard not to want to take some of those kids home with me. We were sorry to leave Siem Reap after only two full days; we felt like we barely touched the surface of this magical world of various times all mixed into one. I have a feeling that was not our last trip to that part of the Asia.